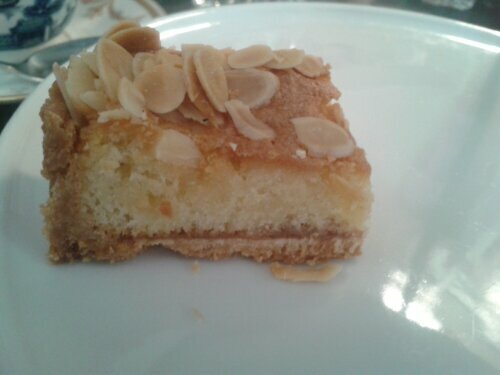 The humble cake is one of the tastiest creations in the history of cookery. 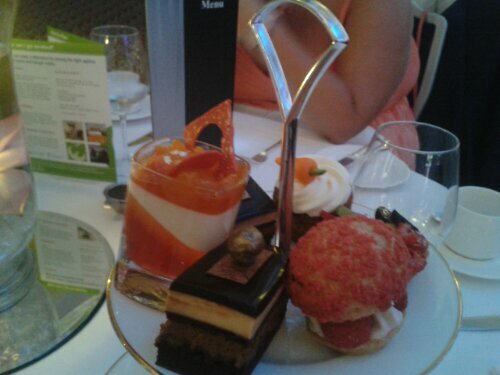 I was blessed to partake in the delicious unveiling of Britain’s best cakes after The Upcoming magazine sent me to review the inaugural Cake Awards in London. Read about my amazing experience here. 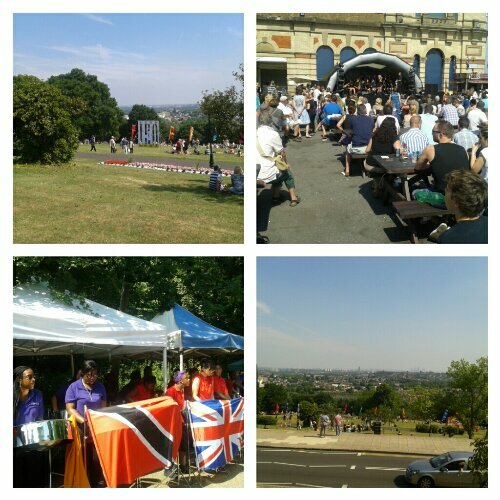 It was a busy Saturday afternoon in London town, with a rare glimpse of sun illuminating the dusty streets. 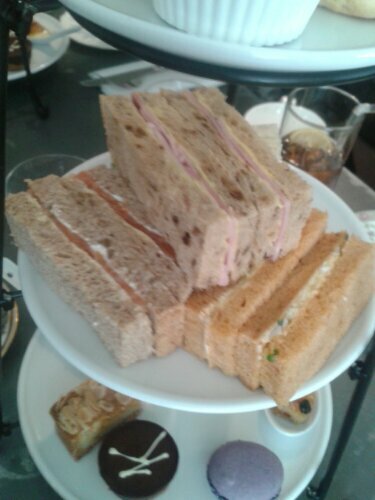 While others hauled shopping bags and rushed to and from retail outlets in search of sale bargains, I was languishing in the Pudding Bar of Soho landmark Kettners, letting the world go by as as I indulged in the most sacred of all British institutions; afternoon tea. It was my belated birthday celebration and I wanted to do something special with my girlfriends but, as not all my party was fond of tea and cake (no, I don’t understand it either), I had to find an establishment that could meet all our needs: somewhere clean, reputable, not too expensive, happy to cater to dietary restrictions, is centrally located and can offer an extensive choice of beverages other than tea. After much research, we decided to book a table at Victorian themed Kettners which has gone through several guises, including shabby pizza parlour before being restored to more lavish glory. Traditional Afternoon Tea is priced at a mere £18.67, in honour of the year the historical venue opened its doors – a steal in a city where afternoon tea can cost the same price as a two beauty treatments! Kettners’ waiting staff were brilliant in dealing with all our individual requirements and even provided a separate food stand for my friend who doesn’t eat pork. They took particular care to keep her items secluded from the rest of our feast and offered to substitute her tier of finger sandwiches with any combination of fillings she preferred from their menu. She opted for extra Egg sarnies which they dutifully provided. The rest of us tucked into finger sandwiches of Ham and English Mustard (delicious, buttery and very flavoursome), Smoked Salmon and Cream Cheese (moist and fresh), Egg and Cress (ever so slightly dry) and Cucumber (a tad dry but buttery and light). 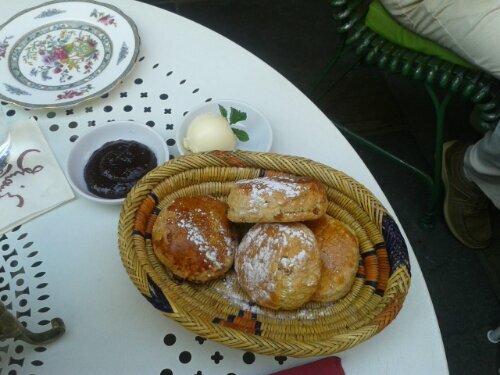 We moved on to Homemade Scones with Clotted Cream and Strawberry Jam: the scones were nicely golden, moist and wonderful. 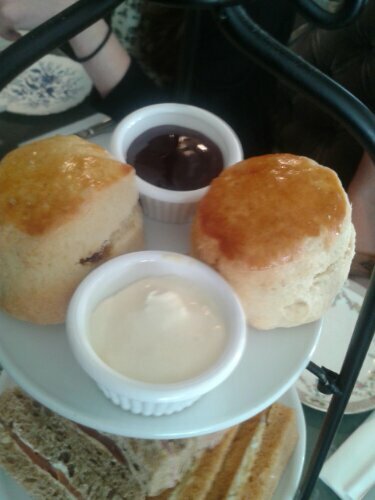 The jam was suitably sweet and we spread it greedily over lashings of thick clotted cream – perfect! 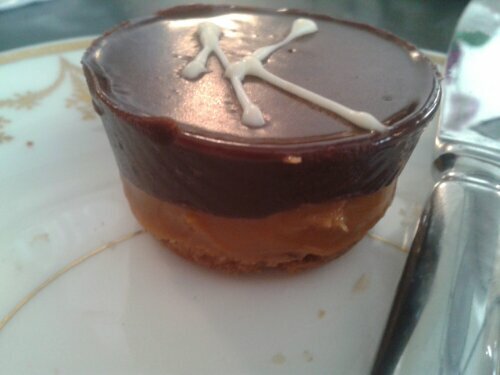 Millionaire’s Shortbread was beautifully baked and topped with a dense, fugde-like chocolate layer that was so rich some of us couldn’t eat more than one bite. I had no such trouble; with a naturally sweet tooth, I was in sugar-high heaven. 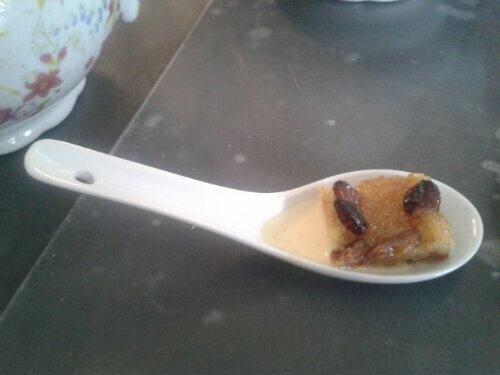 Bread and Butter Pudding, served as a bite sized square in a shallow pool of Creme Anglaise on a ceramic spoon, melted in the mouth and was beautifully balanced. 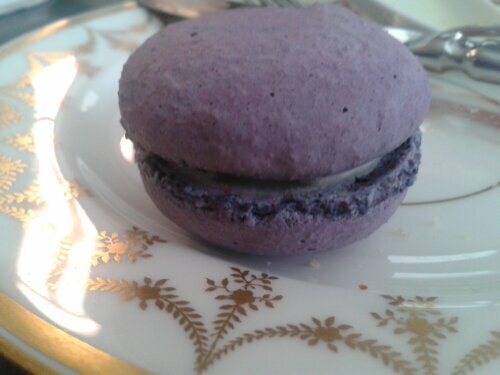 A Violet Macaroon was soft and sugary but the flavour was too subtle to stand out and was sadly a disappointment but Granny Smith Apple Jelly, Rhubarb Panna Cotta was flawless. 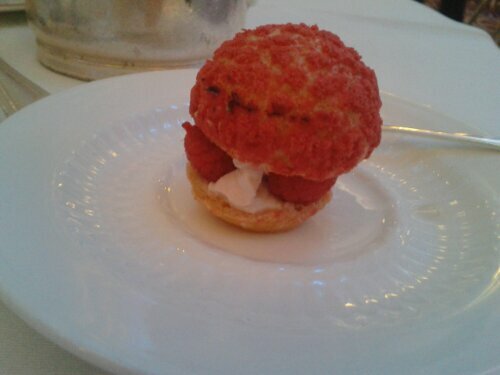 The flavours were beautiful and balanced nicely to combat the sharpness of the fruit. Served in a slim shot glass, my only gripe was that it was challenging to scrape out the wonderful apple base, even with a teaspoon. 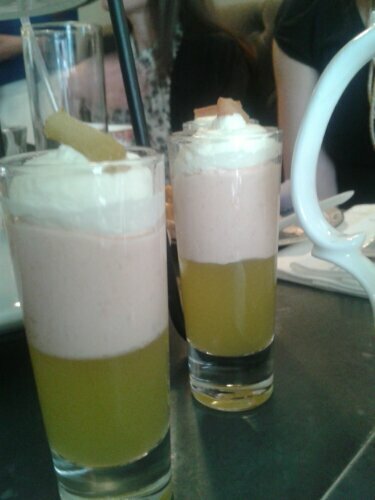 Trying to down it as a shot was also futile – and looked very undignified within such stylish surroundings. 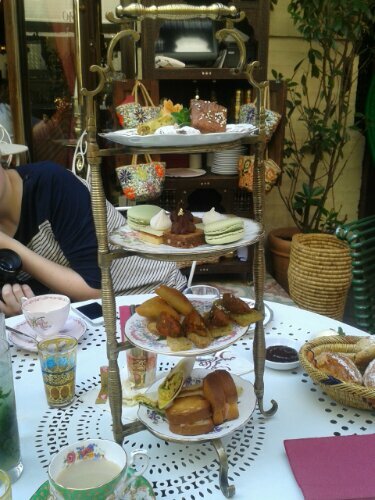 Throughout the afternoon, I had sipped on my favourite tea blend; English Breakfast. Kettners’ variety has a slightly floral undertone, which was exceedingly pleasant. My friends opted for fresh Mint tea, which was fragrant and refreshing. 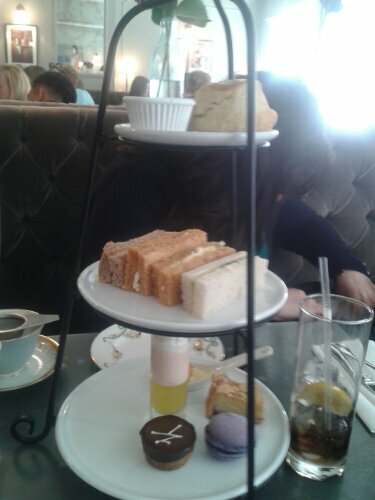 The abundance of sweet treats meant that we couldn’t finish everything and for less than £20, Kettners offers a generous and tasty Afternoon Tea that you’d be wise to partake in. It’s not the most innovative tea you may find in the Capital but, if you’re looking for traditional fayre in traditional surroundings, Kettners is definitely worth a visit. Kettners, is located at 29 Romilly Street, London, W1D 5HP. For bookings call 020 7734 6112 or email: reservations@kettners.com – afternoon tea is served Friday to Sunday from 1pm – 4pm.